Summary: Zero Cost Scavenger Hunt is played in and around your city or town. Recommended Number of Players/Teams: Unlimited players as long as the teams are fairly even numbered. One pillow case or backpack per team to carry items. 1. 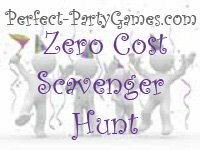 No money can be spent for any of the items on the Zero Cost Scavenger Hunt list. 2. No laws may be broken while collecting the items. 3. Teams must return to home base within a specified amount of time. 4. Each item collected recieves the point values as indicated. Each team has a certain amount of time to collect all the items on the list. When each team returns, verify the items collected and tally the points. If your town has a really great main street where the bulk of the business' are within walking distance, you can use this game for pre-teens or teenagers who still do not drive. If some of the items could not be collected within a reasonable walking distance, than simply delete the item and add a few more to replace them. It's easy. Just mentally walk around your town and see what other items could be collected without spending money. The Around Town Scavenger Hunt can also be customized to fit your town specifically. Just add the name of the coffee shop to get the cup or the name of the realty office where you want the team to get the business card. This added touch will make your game really shine in the eyes of your guests. Winner: The team with the greatest amount of points wins.